Today on the blog, Julien how he met Taylor York, Jeremy Davis, Hayley Williams of Paramore. 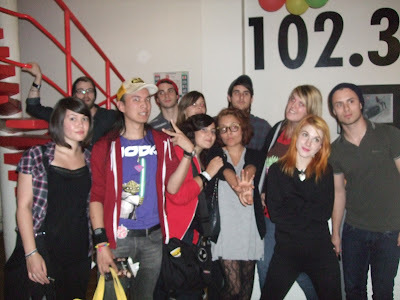 I met Paramore at their meet and greet in Paris. They were suppose to do a showcase but didn't do it in the end. Hayley is awesome. Tiny and cute She told me that my tee shirt is Awesome (^.^) with a great smile on her face. She told me that my tee shirt is Awesome (^.^) with a great smile on her face. They other guys were kind of friendly and asked how we were doing. Haha, I had no other answer that fine "thank you, do you enjoy Paris ?" . Taylor told me : "Yes we love Paris". I made them signed my Twilight book instead of a Paramore CD. They were surprised and glad :D"